A month of distraction, therefore a month of higher-than-usual spending and I think some of this might overlap into next month as I used my credit card to pay for some stuff towards the end of the month. I had family staying (again) so enjoyed some days out, quite a bit of eating out and also had some fun playing cricket in the garden with my nephew. Don’t ask me the rules though, I only know the bare minimum! Had a weekend away at V Festival (the awesome Pink was headlining). 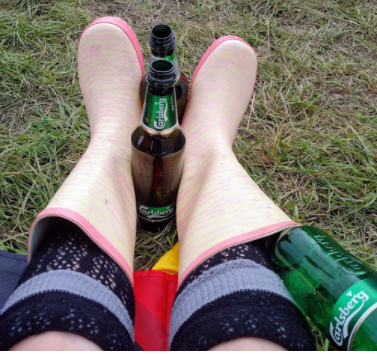 As well as for the music and the atmosphere, I love going to festivals as they’re the only places where I think you can safely people watch (as in really people watch), ie staring at what they’re wearing (or not as the case may be!) and at their tattoos (of which a lot were on show) and nobody bats an eyelid! There’s only so much of that you can get away with on a night out in town without causing trouble! It’s a pity that the only thing available to drink was crap beer (“probably the best worst lager in the world”) but that didn’t stop me from drinking large quantities of it! My fellow festival goers were on wine, which I believe was not a great vintage vile and just got them drunk quicker – apparently, as time went by, it started to taste better! The weather wasn’t great and although we had a few hours of sun, it was just rain later on but we were prepared! Well, I saved 36.2%. Although still a fairly decent chunk of my salary, as expected, it’s lower than my usual figure. My average for the year has now dropped to 46.3%. With only four months of the year left, I have a feeling I am going to struggle to hike it back up on track. 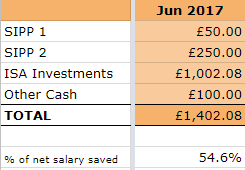 My social diary is starting to fill up, I have a pretty big holiday in a couple of months time and although I will try to keep spending in between these events low, inevitably, my savings rate will continue to take a hit. Of course, I could always sacrifice my social life just so that I could hit my goals but that’s not something I’m prepared to do right now or in the foreseeable future, if I’m honest. As and when I get close to my end goal however, I may change my tune. The above savings includes £100 from matched betting profits and £62.81 affiliate income from OddsMonkey (thank you to all those who joined via my link – much appreciated!). Despite the slight wobble in the markets, with extra capital added, my Future Fund continues to grow and now stands at £125,946. Slowly plodding on towards my next big milestone! I read recently that some poor bloke’s pension fund hadn’t grown in 11 years due to the extortionate fees charged by his provider and thought I’d mention something closer to home. My sister has been over for a visit these past couple of weeks. Over the course of catching up, conversation turned to pensions and she mentioned that a pension plan which she was saving into on a monthly basis in Hong Kong wasn’t ‘doing anything’. In fact, not only was it not ‘doing anything’, it was actually worth less than the capital she had put in over the last 6 or so years! I asked her how this was so, as we were in a run of bull markets and suggested that she checked the fees she was being charged. She said she didn’t have time to look at such things so I said I’d look for her, if she provided me with her latest statement. It turns out that she is investing in various funds (I didn’t make note of the exact fund names and no longer have her statement to hand) which have an initial charge of 5%, plus ongoing fees of average 1.7%. On top of that, her ‘financial advisor’ charged her an admin fee of 2%. Ouch! All those fees were just gobbling up any profits the funds were making! When I told her, she was really annoyed, both at herself (for not making the time to check the fees) and at her financial advisor. To add insult to injury, upon investigation, she found that there was a big exit fee if she were to transfer this pension to another provider. Double ouch! It looks like the only thing she can do is to switch the expensive funds into cheaper trackers/ETFs (if she is able to do so), so that’s going to be one of her first tasks when she gets back home after her holiday. 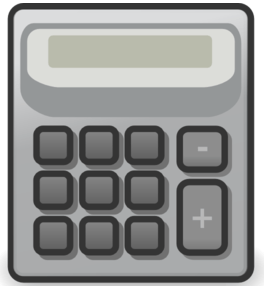 Now that she is conscious of how devastating high fees can be to investments, she will also be considering other pension providers and if she can find a cheaper one, will stop contributing to the current one and set up a new account. My family have been investing a lot longer than I have but it looks there’s still stuff I can bring to their attention! Perhaps I’ll speak to other members of my family to make sure they too are not paying too much fees-wise. When I first started investing, my investments were all in funds. I then switched to cheaper tracker funds. However, just over a year ago, I switched nearly all the remaining tracker funds into ETFs to reduce fees further. The biggest fund I own now is my Vanguard Life Strategy 80% but I’ve worked out that if I switch this one into an ETF, I’m not really saving anything so I’m going to leave it as is for now. The two providers I use for my investments (SIPP and ISA) are Hargreaves Lansdown (HL)* and AJ Bell Youinvest (AJ)*. The latter is cheaper but service and website-wise, I have to say that it’s quite a bit behind HL. AJ has FAR more downtime for its website at weekends (how annoying when the weekend is when I have more time to check my account!) compared to HL and ‘regular investments’ don’t always happen on the day they’re supposed to happen! On the other hand, even if occasionally late, I prefer how regular investments are made with AJ than with HL (investments are made from monies within the account, rather than direct from your bank account) so there’re pros and cons to both, which I can live with. Anyone else changed their investments or switched providers when they found out they were being ripped off? The other day, I was pleasantly surprised to spot a guy reading a copy of ‘Rich Dad, Poor Dad‘ on the tram into work! I’m glad he was really engrossed with his reading and didn’t look up, otherwise he would have seen some strange woman grinning at him, haha! I’ve not read it myself but I wonder if it will change his life as many readers have claimed? Anyway, the month has flown by – I had family staying for a while so had a great time with them, plus the weather was lovely, which was a bonus. I’ve also belatedly started having work done to the kitchen. It should have been sorted while I was unemployed and had lots of free time, but well, I actually didn’t think I would secure a job so quickly, so I’ve been busy sorting things there. And eating microwaved food as I have no oven or cooking hobs! I saved 47.9%! A couple of meals out with my sis carved a little chunk out of what I could have saved but as I don’t get to spend a lot of time with family, it was worth that bit of cost. My average for the year is now 47.8% so still slowly creeping towards my goal of an average 50%, but I need to get a few more >50% to hike it up. Might struggle with next month (more family members coming to visit), but we’ll see. The above savings includes £50 from matched betting profits, £50 from my Premium Bonds win, £10 lotto win, £12.77 from TopCashback* and £57.08 affiliate income from OddsMonkey (thanks to all those who joined via my link – much appreciated!). I sold my XP Power shares to take 55% profit (including dividends received over the 10 months I’ve held the stock) – yes I did it, FiL and of course, will now attempt to avoid checking up on XPP as I don’t want to see that it’s doubled in price now that I’ve sold, haha! :). 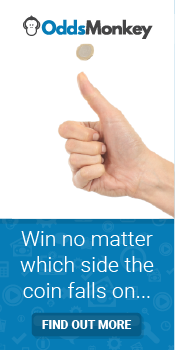 I don’t usually sell any of my shares, mainly because my strategy is to buy and hold, but also because I find it very difficult to decide when I should be selling. Banking some profit can’t be a bad thing I guess, plus at some point, I want to simplify my portfolio so may as well sell stocks off bit by bit. The funds from the sale will be added to my usual monthly capital to top up one of my existing ITs. Current portfolio can be found here. 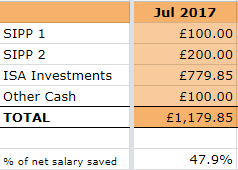 Markets have continued to be mostly favourable, so my Future Fund now stands at £122,659. Continuing to advance towards my next big milestone! I have two sets of friends with whom I socialise on a regular basis so I ended up celebrating my birthday twice on the town this month! Why not celebrate with both sets of friends together to save time and money? It has been considered several times in the past but dealing with potential clashes of characters and personalities (with alcohol involved!) really won’t be worth the money saved and is not my idea of fun! I had a couple of great nights out, and inevitably suffered the consequences afterwards! However, I think I was more worried about my liver/kidneys, rather than my finances! Am pretty settled in now, the days are flying by as I continue to get to grips with different processes, procedures and people. At the last place I worked, there were quite a lot of folk who were in their 40s or older. At my new place, I’m definitely one of the few ‘oldies’, with most people sitting around me in their early to mid-twenties. In the run-up to pay day, talk was just of what they were going to spend all their money on – mostly socialising and buying ‘stuff’, with one young chap ordering a pair of shoes costing over £500 (some ‘must-have’ brand I’d never heard of). I didn’t join in when the others had a go at him for wasting his money, for fear I would go into ‘FIRE mode’ haha! Ah to be young and so carelessfree with money! With both my boss and the rest of the team not being based in the same office apart from on the odd occasion, I’m working pretty autonomously, more so than in my previous job. I think I will appreciate this more as time goes by, although I have to admit that I am actually starting to enjoy my work – not so clueless any more! I still think it’s bloody hard – coming from a highly regulated environment to one that is not so (yet) regulated isn’t easy and my boss warned me that it could get a little frustrating but to be patient as things were moving towards more regulations and controls. I look at their processes and see so many things which would fail an audit. I think I’m one of the few people who actually abides by the clear desk policy, which isn’t enforced but it’s how I’ve been working for the past ten years so I continue to do so. Still, it’s far too soon for me to be making major suggestions of improvements but I’ve been making notes for the future, ideas for projects and such like. The lifts weren’t working the other day so I had to take the stairs. I realised that walking up to the 5th floor isn’t too bad and is a great workout, so from now on, I will climb the stairs every day. I saved 54.6%! My average for the year is now 47.8% so slowly creeping up to my goal of an average 50%. The above savings includes £100 from matched betting profits, £25 from my Premium Bonds win, £20 lotto win and £57.08 affiliate income from OddsMonkey (thanks to all those who joined via my link – much appreciated!). When I saw the my wage hitting my bank account, I was pleasantly surprised. Until I realised that this is my pay without any corporate benefits deducted – I’ve yet to join the company pension scheme (although the contribution will be low) and I no longer have the ‘premium benefits’ I used to enjoy, namely medical, life insurance and critical illness cover. Oh and my corporate gym membership was also deducted via salary sacrifice. Another birthday celebrated, another year older – although I keep myself pretty fit and healthy and have a fairly balanced diet, age will catch up at some point so perhaps I need to consider my own medical cover seeing as I no longer have it. I was given a quote by the insurers who used to provide my company medical cover but it was nearly 4 times what I used to pay! What a rip off! I’ll do a bit of research, methinks. 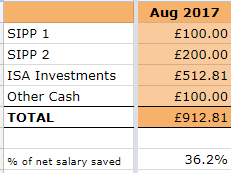 I have now shifted what’s left of my severance pay into my Future Fund, giving it a decent boost and it now stands at £119,717. A good step towards reaching my next big milestone!